According to a poll of investors, Peabody Energy is the coal stock that's most poised to outperform. NEW YORK (TheStreet) -- There's been concern among investors that coal stocks are heading for trouble amid falling natural gas prices and the growing preference among many utilities for renewable resources and natural gas as opposed to dirty coal. Amid this growing sentiment, coal companies such as Consol Energy ( CNX - Get Report) are making their way into natural gas territory. In April, Consol announced the completion of its deal to buy Dominion Resources' ( D - Get Report) natural gas business for roughly $3.475 billion in cash. Despite the bearish trends for coal, a number of analysts believe there's upside for the industry; the bullish indicators are there. Also noteworthy in the bullish regard for coal and the economy is Berkshire Hathaway ( BRK.B and Warren Buffett's large Burlington Northern Santa Fe railroad purchase earlier this year; Burlington is the second-largest railroad operator in the U.S., and one of the largest transporters of coal. Currently, S&P coal analyst Mathew Christy's 12-month outlook for the coal and consumable fuels sub-industry is neutral, based on his belief that demand for coal will increase in 2010, as thermal coal inventories are reduced on higher electricity demand and little to no fuel switching, along with firmer demand in the seaborne and metallurgical coal markets. Meanwhile, market research firm IBISWorld said coal exports have been rising over the past five years, given that firms have been serving the Asia emerging markets where steel production -- a major source of metallurgical coal demand -- is still booming relative to the U.S. markets. Indeed, coal analysts such as S&P's Christy continue to have favorable views on a number of coal stocks and to believe they will continue to do well amid natural gas concerns and relatively stronger steel market deman in the growing emerging market economies. Those stocks include Alpha Natural Resources ( ANR, James River Coal ( JRCC, Arch Coal ( ACI and Peabody Energy ( BTU - Get Report). In light of all this, we recently asked readers of TheStreet which coal stock of the ones above they consider to be the alpha stock of the group, and which they would most likely invest in over the next 12 months. The winner of the group was Peabody Energy, with 28.5% of the poll votes. Bullish attributes of the company include its large size and direct exposure to greater-growth markets such as India and China. Alpha Natural Resources, James River Coal and Arch Coal received 25.6%, 24.4%, and 21.5% of the votes respectively. 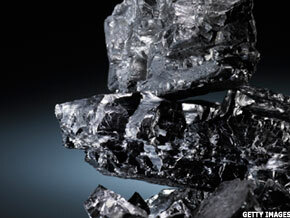 >>Which Coal Stock Is a Buy?